Hasbro's new Movie Masterpiece series features Masterpiece renditions of popular characters from the Transformers Movie Franchise. MPM-4 MPM-04 features Masterpiece Optimus Prime, including alternate mask, articulated figures and more! Optimus Prime transforms from his telltale semi truck to leader of the heroic autobots and back! 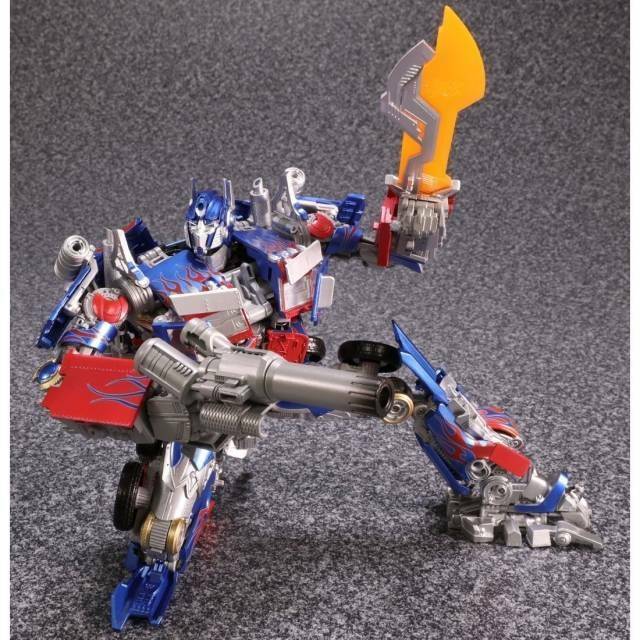 Get in the action with the latest figure from the MASTERPIECE MOVIE SERIES, the OPTIMUS PRIME MPM-4 figure! Co-created by Hasbro and Tomy, the figure is inspired by the iconic OPTIMUS PRIME character in the original 2007 TRANSFORMERS film and celebrates the 10th anniversary of the TRANSFORMERS movie franchise. Pay homage to the great AUTOBOT leader with all the detail you expect from a MASTERPIECE product, including die cast parts! The OPTIMUS PRIME MPM-4 figure converts from robot to classic truck mode and showcases Earth's greatest protector with eye-catching detail, articulated fingers and an interchangeable mask - perfect for fans and collectors alike. The sleek, signature flame design is emblematic of his inextinguishable drive to fight for freedom. Converts in 43 steps and comes with a Matrix of Leadership accessory and other exciting weapon accessories.